Monti Rajkhowa, executive engineer of production divison of ONGC, Assam successfully summited Mount Kanchenjunga with the ONGC team on Sunday morning. Five members out of the 15 member ONGC Mt. Kanchenjunga expedition team, successfully summated the third largest peak in the world at about8.15amNepal time on May 20. The five members are – Nirmal Kumar, Monti Rajkhowa, Pankaj Joshi, Gaurav Kadian, Palkesh G. Kalma. The second group of four ONGC employees and one Indian Mountaineering Foundation member summitted the peak on Monday. With this, ONGC, whose team also scaled the Everest last year, becomes the first Corporate in the world to accomplish this difficult and unique feat, an ONGC Corporate Communications press release said. 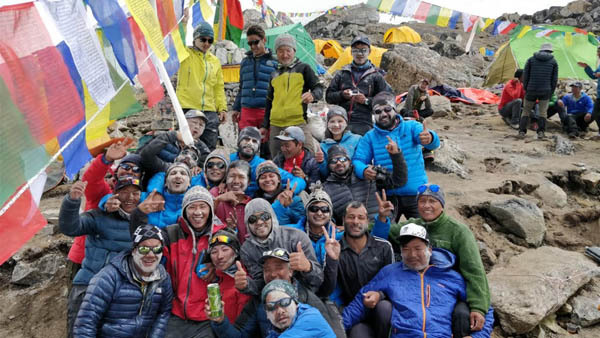 The team attempted the summit in two groups, with the first group, comprising of expedition leader Nirmal Kumar, Pankaj Joshi, Monti Rajkhowa, Palkesh G Kalma and Gaurav Kadian scaling the peak at around8:15 amNepal Time on May 20, and the second group comprising of Yogender Garbiyal, Rahul Jarngal, Akash Bavariya, Surendra Prasad Jakhmola and Indian Mountaineering Foundation’s Sheetal scaling the peak on Monday at around3:40 amNepal Time. The Kanchenjunga expedition team had three women members, out of which ONGCian Monti Rajkhowa and IMF’s Sheetal successfully summited the peak while Shipra Batra, another ONGCian accompanied the team as support staff. Monti Rajkhowa was also part of the Everest expedition last year, scaling up to camp 4 at an altitude of 8000 m.
The team led by Nirmal Kumar had climbed the mountain, considered to be the most difficult and challenging from the south east route of Nepal. The mountain which is 8586 feet, lies in the Nepal-India border in Sikkim state. Last year an 11 member team of ONGC had climbed Mount Everest setting a record in which a corporate team had for the first time climbed the highest mountain in the world. Monty Rajkhowa who had also been in the team to Mount Everest, had gone up to base camp 4. Those who reached the peak were Nirmal Kumar, Yogendra Garbiyal and Rahul Jarngal. Surendra Singh Tomar had gone up to base camp 3. The team to the Kanchenjunga expedition had been flagged off by Union Minister for Oil and petroleum gas and skill development and entrepreneurship Dharmendra Pradhan at New Delhi onApril 2.